Water is a vital need in the lives of living things.One cannot survive without water. The fact is happening today is the reduced availability of clean water and its sustainability as well, many people especially in developing countries have no access to adequate potable water services.Thus, the need for clean potable water, information on the demand side, its sustainability are timely a hot issue among countries and is a global concern.Hence, involving community members in evaluation of their WTP for improved water services projects brings new insights. 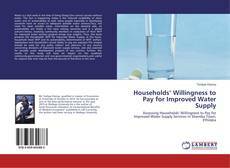 Thus, this book presents the Households’ WTP for Improved Water Supply. In this book, household mean WTP and its sustainability, determinants of WTP, welfare implications and household’s actual ability to pay are assessed.The analysis should be used for any policy makers and planners of any country concerning decisions of improved water supply services, and also essential for potable water development projects of any country. Further, the results of this study will have an impact on the academic community,governmental and non-governmental organizations,and useful for anyone else who may be face the paucity of literature in the area.